We have an Excellent Reputation in Our Community, it’s Verifiable..
Our painting service was established in 2010 by Zachary Bristol- a seasoned Jacksonville painter who quickly realized the need for more professionalism in the painting industry. With his customers in mind, Zach created a different kind of painting company-one with integrity that could be trusted and counted on for superior service and quality standards. Since then- Straight Edge Painting has grown to having three different painting crews and vans on the road at all times- all while undertaking over 1,000,000 in painting projects annually. Our company is Jacksonville's Leading Interior Painting and Exterior Painting Professionals- this is verified by our excellent reputation online with customer reviews. Our painters maintain the best reputation online with over 304+ Authentic Reviews on trusted websites like Angie's list, Google, Houzz, Yelp, and the Better Business Bureau. 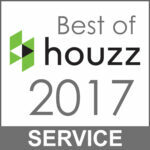 We also have been given Top Awards for Being the Best Painting Contractors in Jacksonville by Angie's List and Houzz 4 consecutive years in a row- 2013-2017. Yelp voted us best of Yelp in 2016. As you can see- Our painters in Jacksonville FL are known for their Top Quality Craftsmanship and For Giving The Best Customer Service in the Business. We maintain $2,000,000 Million of aggregate liability insurance as well as $1,000,000 Million Workers' Compensation insurance on all of our workers to protect you from any accidents that could happen on your property. Our Jacksonville painters offer the following services: interior painting, exterior painting, cabinet painting, cabinet refinishing, popcorn ceiling removal, staining, wallpaper removal, stucco repairs, drywall repairs, and rotten wood repairs. Our Top-Rated Professional Painters Serve the Following Areas: Jacksonville, St. Johns County, Ponte Vedra Beach, Jacksonville Beach, Atlantic Beach, Neptune Beach, Nocatee, North St. Augustine, World Golf Village, Julington Creek, Mandarin, Fleming Island, Orange Park, Riverside, San Marco, Avondale, Murray Hill, and most areas in between. Call for our complete service area listing. With us you can be assured that your project will be done right the first time, without hidden charges, hassles or poor quality. We bring a level of experience to your project that few other painters can approach. We are not just your average painting company- We are A Higher Level, Quality Driven- Painting Contractor who delivers Superior Service to our Customers. Straight Edge Painting tries harder and cares more then most painting companies. This means you get a better looking, and longer lasting paint job that was done properly by experienced painting professionals. We back our painting up with the best customer service in the business; from initial project coordination- all the way to the end of your project where we give you a change to inspect our work- we don't leave the job until you are 100% happy with the job we did! We are also available for any warranty issues- we stand behind our work! The biggest secret to our success are the painters we have working for our company. The quality of painting that any company offers is only going to be as good as the painters who show up to do the work. A lot of companies don't train and don't care about maintaining any type of standards for their customers- not us! We hand pick the very best Jacksonville painters we can find and then we train them to meet our company standards- which are really involved. We have trainings, systems, and company standards that all of our painters are expected to learn and deliver. Our professional work vans (one on every job) are fully equipped with all the right tools and supplies to do a professional job- no companies do this for their painters! We care about our painters, and in turn- they care about doing a great job for our customers. We also only use the best paint products and supplies- this coupled with us employing only the best painters is how we offer a higher quality painting service to our customers.